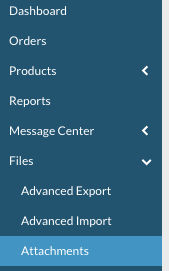 The Attachments section of the Portal keeps a record of all of the files that have been uploaded or created by the system on your account. Examples of files include EDI files, XML files, inventory files, etc. traded between retailers and suppliers. 2. You are provided key details about the attachment: the date it was received in to the Logicbroker system (in your time zone), sender/receiver of the data, the file name/description, the type of file and the size of the file. 3. You are able to filter the data, such as by date range, sender and receiver. As an example, see below for how to sort by EDI file type. 4. Once the filter happens, you can remove the filter by closing the filter out by clicking the X on the filter. As an example below, you would close out the "Type is edi" filter by clicking on the X. To download the file, click on Download.